Alex Attard: Parallel Existences: The Notarial Archives: A photographer’s inspiration. Books, in this case the 22,000 volumes of notarial deeds housed at the Notarial Archives in Valletta, are a means to an end – they are among the objects and technologies that make possible the classification, inscription, storage, and dissemination of words. At the same time they are also objects in their own right, and may be regarded as craft or art, among other things. 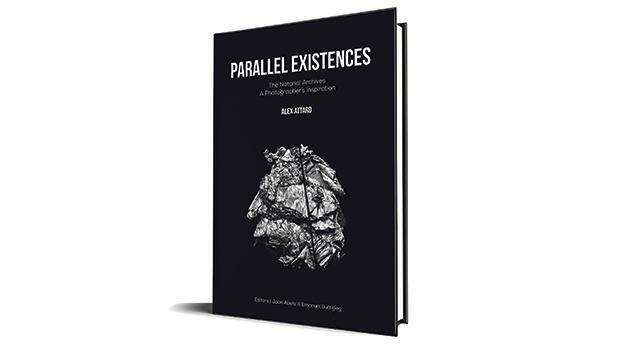 Parallel Existences, which is in some ways a book about books, incarnates this multiplicity in a number of ways. Most obviously, it is itself a beautiful object. Kite, the welcome newcomers to publishing in Malta, have mostly done the editors and contributors a service and delivered a hefty and handsomely-produced book that feels good in the hand and looks good on any bookshelf. The binders who used thin strips of leather to sew together Notary Giuliano Briffa’s deeds in 1589-90 would not feel that their unwitting work of art was out of place in this volume. The notaries who wrote their deeds in refined script, and sometimes added fascinating little doodles and sketches, might even call the book magnifico – high praise indeed in the trade. How fitting, then, that the Notarial Archives are currently undergoing a radical refurbishment that will provide the volumes with a beautiful and functional home. Second, this book is in effect two books. The first part reproduces the photographs of Attard, which were recently shown at Valletta Contemporary. Attard worked in what staff at the Notarial Archives grimly, if fondly, call the ‘crying room’ – a space on the top floor stacked high with volumes that were seriously damaged by war bombing and then left to rot for 60 years. As Konrad Buhagiar and Guillaume Dreyfuss put it in their essay, the “photographs of crumpled, soiled and ruined paper documents in the Notarial Archives of Malta, give these papers a streamlined lightness, made heavy only by the gruelling labour of compression and gravity that turns them into the semblance of geological gems”. Indeed, Attard’s splendid work shows how the photographer’s art contrives with the time of events (the war) and that of the longer term (decay) to produce images of great beauty and intrigue. The theme is taken up in accompanying thoughtful essays by a number of artists and critics. The second part of the book explores the value of the Notarial Archives as a repository of information about the past. Thereare nine meticulously researched chapters on a broad range of topics; all are based on materials present in the archives. Theresa Zammit Lupi, who is in charge of conservation at the archives, writes about how medieval manuscript fragments were recycled into covers for notarial volumes. Her detective work recently uncovered three Byzantine fragments that date to the 11th and 12th centuries, and that are the oldest known materials in the archives. Charles Dalli traces the hierarchies and geographies that pattern the “social vocabulary” of a 15th century notary. Stanley Fiorini sums up the impressive extent of land ownership by the mendicant orders in the early 17th century. Stephen C. Spiteri focuses on a document recently found in the archives which sheds light on the Orsi Tower, a little-known fortification that once stood at the mouth of the harbour. Jews in early modern Malta are not an easy topic to research, but Sarah Azzopardi-Ljubibratic shows how materials at the Notarial Archives help overcome what is otherwise a sparsely documented aspect of the past. Christina Meli sleuths for contracts to make an argument for the understanding of the work of the sculptor Pietro Paolo Zahrain the context of the Roman Baroque. Vicki Ann Cremona, a specialist on the history of theatre and in particular Carnival, finds much in the notarial deeds that is relevant to her field. In 2017, several sheets of music were found tucked inside the covers of a notarial volume. Alex Vella Gregory calls them “not great musical masterpieces”, but he does not doubt their outstanding value as far as the history of Classicism in late 18th century music in Malta is concerned. Finally, Caroline Tonna discusses how material in the archives helped her piece together the story of photography in the late 19th century. Two books in one, then, which at first glance might be put down to a misguided editorial decision. Only it turns out that the two parts are not just sewn together within the same cover. Outwardly disparate though they may be, a closer look shows that they are in dialogue with and inform each another. They rightfully belong together, because it is in that way that they invite us to think about the nature of the book. I found myself spending several minutes looking at and contemplating each image in Part I, and turning the pages and reading in a more mundane way in Part II. Parallel Existences helps us understand why, at a time when new technologies are said by some to render the book obsolete, there is a buoyant and growing market for books that both contain and look the part.